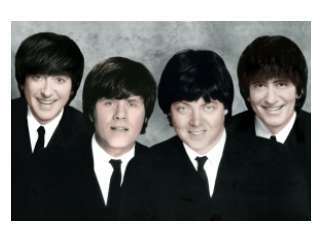 "1964: The Tribute" takes its audiences on a musical journey to a nostalgic era in rock history. In an authentic and endearing tribute, the group recreates early live Beatles' concerts from 1964, with period clothing, hairstyles, and onstage banter. This year marks the 50th anniversary of the Beatles' historic Carnegie Hall appearance. They look and sound like The Beatles. The performance, professionalism and musicianship make the illusion complete. Band members are Mark Benson as John Lennon, Mac Ruffing as Paul McCartney, Tom Work as George Harrison, and Robert Potter as Ringo Starr.